The NH Murcia Centro hotel, formerly known as the Hesperia Murcia, is centrally located in the city center right next to the cathedral, with Gran Via, the citys main thoroughfare, a mere 50 meters away. The hotel is just a short walk from the museums, shops, and restaurants and the Segura River is also nearby. All of our 120 rooms are decorated in neutral shades and have free Wi-Fi and satellite TV. Our Junior Suites have a little extra space and have sofa beds, making them ideal for families. A daily breakfast buffet is prepared especially for our guests. Made-to-order hot dishes and an early bird breakfast are served upon request. For dinner or lunch, our welcoming staff is happy to suggest highly-rated local dining options. The NH Murcia Centro has 3 meeting rooms that hold a maximum of 75 people. We will gladly organize and schedule drinks, multi course meals, and anything else you may need. 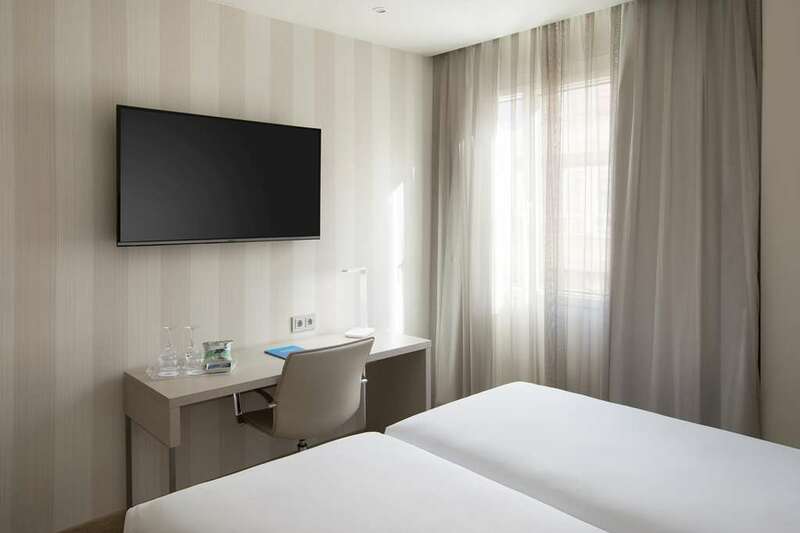 The NH Murcia Centro provides 24-hour front desk service and can arrange dry cleaning, laundry, and wake-up services or baby cribs in order to help exceed guest expectations. The hotel is located in the historic and commercial centre of Murcia.